CRAFTSMAN INSPIRED -- "The Bungalow" by John Stinger, an original giclee canvas print signed by the artist on the front and hand signed on the back stretcher is available in the craftsman-inspired wood frame as shown for $395, or mounted in a 4-inch wide quarter sawn golden oak frame for $425. John Stinger of Stewartsville has been a New Jersey artist all his life. For the past four decades he has also been a serious antiques and art collector with a special interest in the arts and crafts movement. He has created Stinger's BungalowArt, a unique style of oil painting that incorporates both his love and understanding of the old craftsmen movement, with his love and appreciation of today's contemporary art. 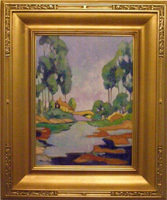 The Craftsman movement, inspired by Gustave Stickley and refined by Frank Lloyd Wright, was reflected in every form of art including architecture, painting, sculpture, printing, photography, graphics, furniture, textile design, lighting, tiles, pottery, metal working and just about anything that required the hand of a designer. American bungalow design was directly inspired by the Craftsman movement and found its initial public appeal in sunny, booming California during the early 1900's. The marketing creativity and retail genius of Sears -Roebuck helped spread it across the county, when the company began to sell these homes in kit form via their famous catalog. And sell they did. These packaged-homes captured the imaginations of Americans and were ordered by the thousands. Not only were they stylish, smartly designed and easy to build, they were affordable. Soon people in every state in the country were building these "four square cottages," as they were affectionately called. The dream of owning a home was becoming a reality for many Americans. Today, these homes- both vintage and newly constructed ones- are based upon the same design concepts of their originators and their appeal increases with each new generation. Owners of these classic bungalows or cottages work diligently to maintain the look and style both inside and outside the home. The architectural styles of these bungalows included something for every taste: Victorian/Queen Anne (1855-1905), Mission (1890-1915), Tudor (1890-1930), California (1900-1930), Prairie (1900-1920), Spanish Revival (1915-1930), Log Cottage (1915-1930), Colonial Revival (1915-1930) and Moderne (1930-1940). These American art-form bungalows can be small, affordable and tidy or as expansive and ostentatious as the home owner's imagination and budget will allow. But it makes no difference how small or large; the bungalow style is what really matters to most cottage connoisseurs. One thing is certain -- the love affair with the American bungalow continues with no let-up in sight. And now thanks to Stinger, the interior walls of these bungalow classics will finally have something new that fits the decor and maintains the unique look and tradition of previous Craftsman masters. Stinger has four copyrighted original paintings he is offering as canvas giclee prints, mounted in exclusively designed fames. His art, in period-appropriate frames, correctly reflects the Craftsman period. The result is something special that will please the most discriminating bungalow owner. For more information about the artist and his work, call 908-319-8957.